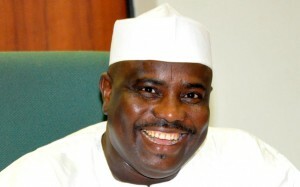 Governor Aminu Tambuwal of Sokoto State has come under blast from President Muhammadu Buhari support group, the Buhari Media Organization, BMO, for saying that it would be suicidal if the President returns to power in 2019. “President Buhari is fully in charge and in control of the government of the Federal Republic of Nigeria and anyone who is in doubt of this is in grave error. “We wish to note that Governor Tambuwal has not only failed to serve the people of Sokoto State diligently in the past three and half years, but has, in his utterances, displayed crass ignorance on sensitive national issues. “Perhaps the clearest evidence of Tambuwal’s failure as a politician and governor is that he has turned himself into an errand boy of his fellow contestant, Atiku Abubakar and the opposition PDP. The post “You’re Atiku’s Errand Boy, Failed Governor” – Buhari Group Attacks Tambuwal appeared first on LATEST NIGERIAN NEWS BREAKING HEADLINES NEWSPAPERS.